Yesterday, Monica and I went for a day trip to France with my Mum. We went Dover-Calais and, after a visit to CitÃ© Europe, we drove to Dunkerque (Dunkirk). We visited the beaches, the memorial and the war museum. The chap at the museum was quite chatty, nice bloke, good chance to practise some French. 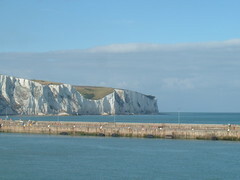 It was cloudy in Northern France all day, but Southern England was bathed in sunshine. Hier, j'ai visitÃ© France avec ma femme et ma mere. Nous avons visitÃ© les plages, la musee et la memorial Ã Dunkerque. En France, il faisait nuages, mais en Angleterre il faisait soleil! Corrections (with explanations if possible!) to the French gratefully received.